A few days ago I spent time in LA covering the premiere of Disney’s Alice Through the Looking Glass and yesterday I shared with you my time on the Red Carpet Premiere of Disney’s Alice Through the Looking Glass. 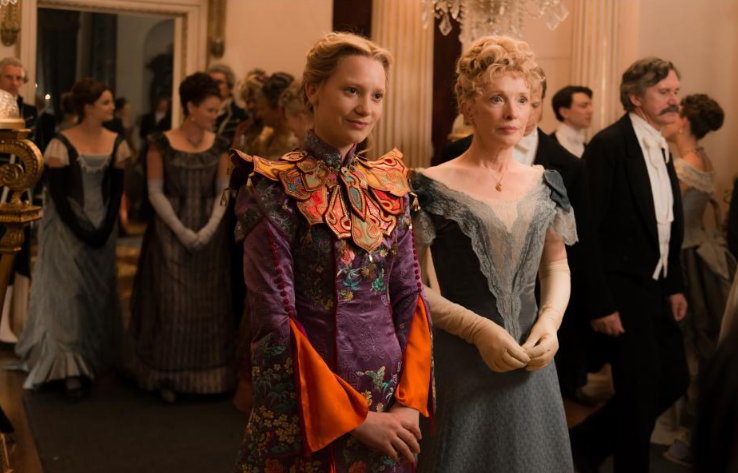 I am so excited to share with you my sit down interview with Mia Wasikowska! She is just darling, very well spoken and seems to be very passionate about her role as Alice in this film. I have now seen this film twice (and we are seeing it again this weekend!) and I have to say, her character is so inspiring and I think that young girls are going to really be moved by this character. As you will see in the interview below, Mia clearly understands the importance of this character and the messages that the film shares. One scene I really like is when I see the hatter in the marketplace and I’m trying to explain to him that we’ve met, but when he’s older and I’m younger. I think that’s so sweet, and it’s got like such an essence of the original book to it, that whole abstract, quite bizarre nature of it. Alice has grown up a bit since the last film. She seems more independent. How did it feel stepping back into the role with those changes, with the years that have gone by? It was was great. I really love Alice and I like seeing her journey. I think in the first film, she was quite, kind of still a little uncomfortable and trying to bridge that gap between knowing who she is on the inside and then being able to be that on the outside. And I think that was sort of her journey in the first film. And then in this film, I think she’s just spend two years as the captain of her own ship, and she has a really strong sense of who she is. She comes back into this story with a really strong sense of that, and despite the fact that expectations of her are really low in her society, she manages to sort of hold on to that sense of being worth more than what people want of her, which I think is really great and important for young girls and boys, obviously, everywhere. This movie has so many incredible quotes and one liners. 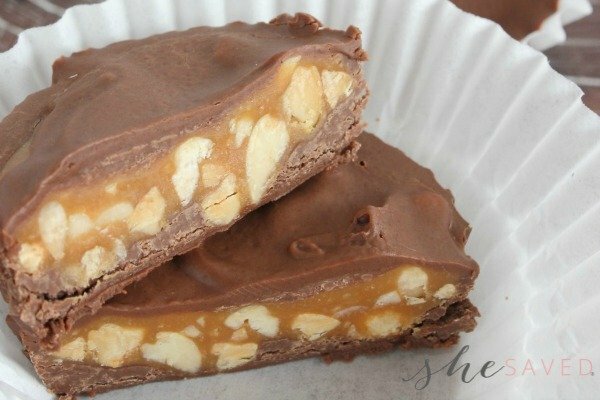 Is there one that resonated with you more than some of the others? There are so many, but I do like the message of time and how you can’t change the past but you can learn from it, and I think that even though we kind of know that, I think really deeply understanding that is really important and it’s the best way to live your life and be in the moment. To accept what’s happened in the past and move on into the future. Not be fixated on trying to change something that’s already happened, which I feel like we can get a bit caught up in. You have a lot of relationships with the other characters in the movie. Is there one relationship that stood out more, that was your favorite? I like a few of them. I do like the relationship with Alice and Time. I think Sasha plays like a confident idiot very well. He’s like this old powerful like loser in a way and Alice is the only one that kind of isn’t scared enough to pull him out on how he just doesn’t make any sense at all. I like that she sort of has no fear in approaching anyone, but especially him, because he’s gotten such strong ego. 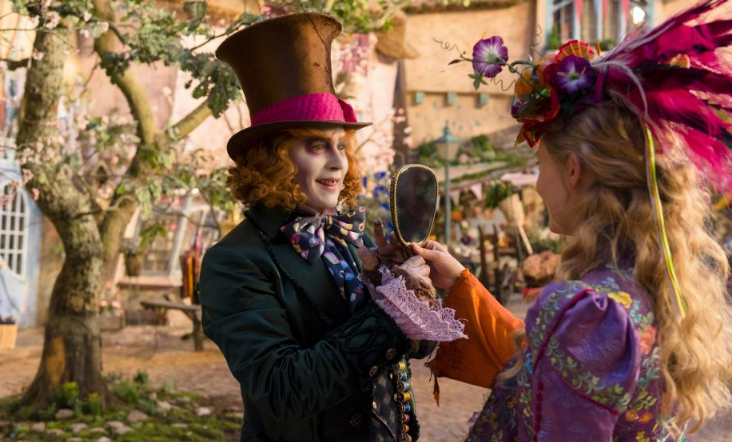 And then I also really like the scenes with the Hatter. I mean, when you’re filming a film like this and it’s green screen for five months, you spend a lot of time running around and jumping around. And so obviously the more enjoyable days were spend filming those really lovely scenes between the two of us, that was really nice. Is there a particular message that you’d like for girls to take away from this movie? Alice seems to have this innate sense of who she is and even though she’s got all these challenges and people always questioning her, she manages to hold on to that really strong sense of herself and even when she goes to the ball with the oriental costume she just doesn’t’ even seem to notice the judgment coming off of everybody else. That sort of just seems to roll off her back. I guess just that sense of not caring so much about what other people think, I think, is really important. What was it like working with Johnny Depp this time around, and how was it different from the first time? It was great. The main difference was just that I knew him before and with all the cast I had that level of familiarity with them which was really nice. So we all sort of knew each other and that always helps stepping into a project like this, which is quite abstract. He’s such a wonderful person, such a lovely, sensitive like person and I love that he’s so creative. I mean, all his characters are very, very different, but they’re also distinctly his own characters. How does it feel to be a role model for young girls and young boys everywhere? It’s really great. I mean, it’s not something I ever considered until you’re doing a film and then you see that it has an impact on people. It’s not something that I really ever thought about until after the fact, but I mean, I’m excited for this film because I think, for all sorts of reasons, we’ve come a long way and especially in terms of satirizing the idea of female hysteria, which only a hundred years ago was taken very seriously. So it’s a big step to be able to be like this is so obviously ridiculous. Whereas not so long ago, it was so serious. That’s like a big step, and there’s obviously a long way to go before things are entirely equal, but I’m excited that slowly it’s more normal that there’s a lead character in a big summer movie that’s a female, and such a feisty one. She’s not a love interest but instead she’s a friend, a loyal person, and I think that’s really important. 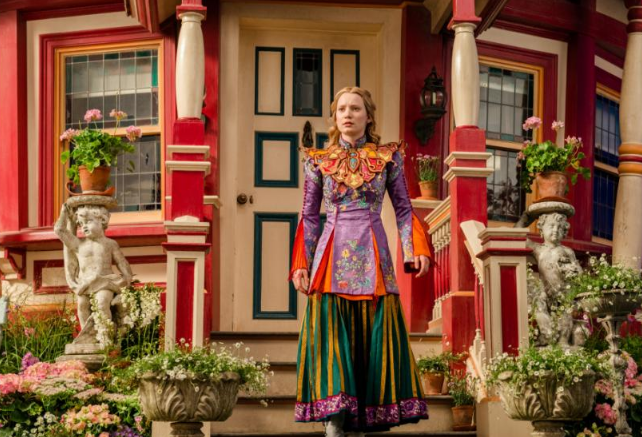 Disney’s ALICE THROUGH THE LOOKING GLASS hits theaters May 27th!! 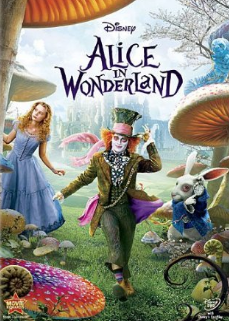 If you haven’t yet seen Disney’s live action ALICE IN WONDERLAND, I highly recommend it! 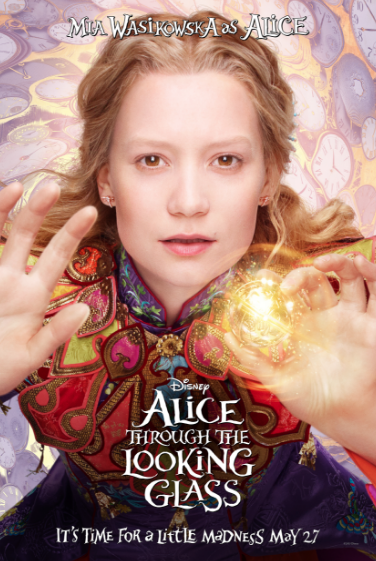 You can purchase that ALICE IN WONDERLAND on Amazon right now for under $10, and it is one of our favorites… so excited to see what our favorite characters will be up to in THROUGH THE LOOKING GLASS! 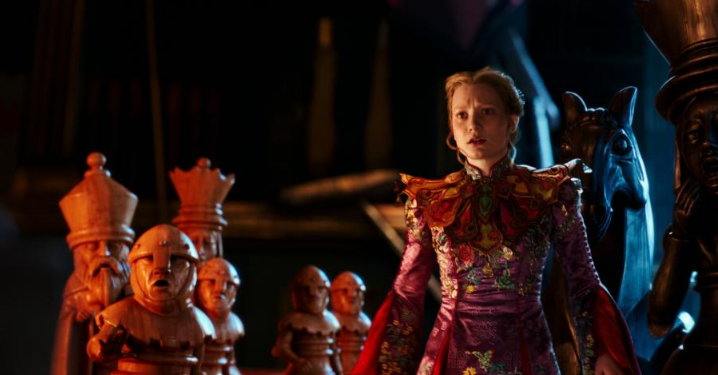 Visit the official ALICE THROUGH THE LOOKING GLASS site. opens in theaters everywhere on May 27th! « She Saved FAVORITE!! Kinsa Smart Thermometer $14.99 + FREE Shipping!